Enjoy the new levels! In this version of classic Bomberman you'll have to set bombs and try to obliterate your rivals. Both single-player and two-player modes are available. Enjoy the new stages! In this version of classic Bomberman you'll have to set bombs in order to obliterate your rivals. Both single-player and two-player modes are available. In this version of classic Bomberman, robots are the main characters. Place the bombs in the right spots to defeat your enemies. Both single-player and two-player modes are available. In this game based on Bomberman, you must place bombs to destroy your adversaries. Both single-player and two-player modes are available. In this version of classic Bomberman you just have to place bombs to get rid of your rivals. One or two player mode avaliable. In this multiplayer version of Bomberman you'll be able to face thousands of users. Place bombs and try to make them all explode! Get as many bonuses as you can. This version of Bomberman includes a multiplayer mode! Choose a robot and start challenging your friends or other users. Place bombs on the ground and try to kill them all. In this version of classic Bomberman robots will be the main characters. Learn the controls before starting a new game! Both single-player and two-player modes are available. Enjoy the sequel to this Bomberman version. Clear every level using firecrackers! Both single-player and two-player modes are available. New skills have been added to this awesome version of Bomberman. Set bombs in the right places to blow up the obstacles and enemies without hurting yourself. In this version of classic Bomberman robots will be the main characters. 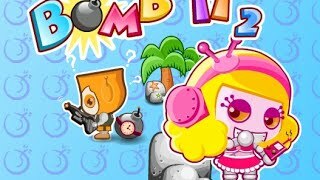 Place the bombs tactically and defeat your enemies! Both single-player and two-player modes are available.